Wn Pen05b H.K.B, Bernival, StP.Gruppe Penly, K.V.A. 'E2'. Haute-Normandy. 1 x 8.35cm Flak M22(t). H.K.A.R - Heer Kusten Artillery Regiment. H.K.B. - Heer Kusten Batterie. The view from across the valley to Pen05b. Battery site around late 1940s. le Petit Berneval sitting out on the cliff overlooking the port of Dieppe which its guns would have protected. 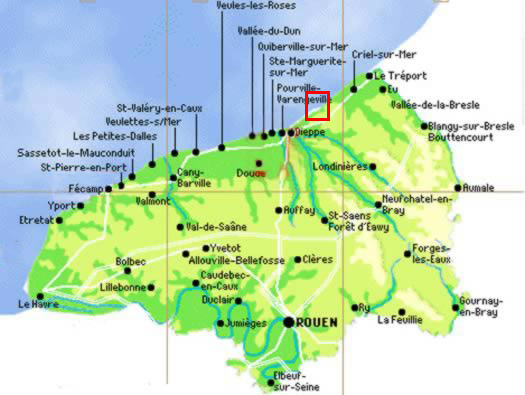 Direction of fire of the battery was towards Dieppe Harbour. Battery position out on the very flat top of the cliff. 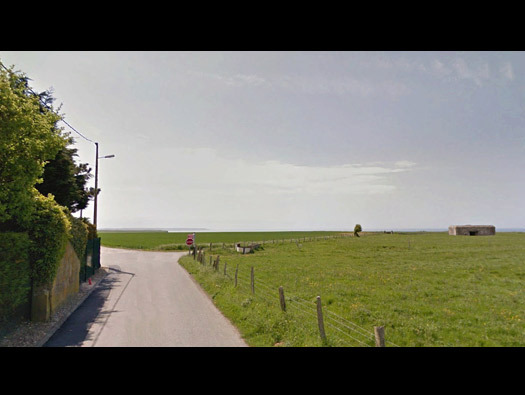 Only one casemate was built and I believe two were in the process of being constructed and the rest of the battery site was to the left of the road in where a lot of housing has been built. If you wish to, walking through the estate it will throw up lots of odd interesting features. One is a latrine and several small bunkers. Most has been built over now. 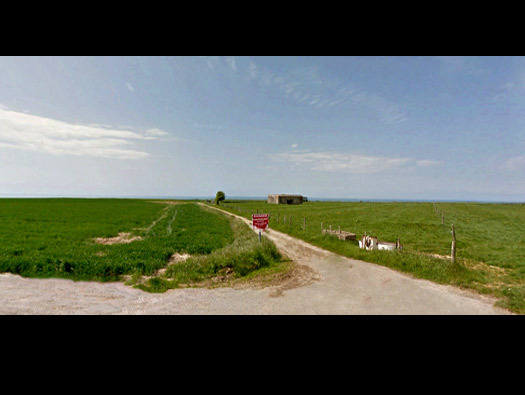 Sitting on the side of the road is this bunker, there were 2 x Unterstand, 2 x Feldm, 7 x Wellblech and 1 x Latrine. Red is the R669 and I think yellow is/was the Leitstand (fire control post. This could be the the Leitstand?? now in the sea. There was getting on for 600 of these bunkers built and probably many more planned and starting but not finished. From this 1940's photo you can see construction work in progress. Casemate for a field gun. . I am presuming a I cannot find out what guns were going inside that the 12.2cm guns were to be casemated and the 17cm guns being too big would either be withdrawn or continue in open field emplacements in the area. 17cm K18 artillery in open field emplacements in North Africa. R669 gun room now full of water..
Two small ammunition niches each side one the shell room and the other for case and powder bags. I am not sure if this space is big enough for a 12.2cm gun or not? In fact looking closely at this picture of a 12.3cm gun, the bunker behind looks like a R669? so it may do.